Meet Lizzie’s new little brother. His name is HAL and he’s a 9 week old mix of we-don’t-know-what. Update: He’s a Texas Heeler! He and his 9 litter mates were found on the side of the road in Pflugerville, covered in scabs from multiple flea bits. A nice person took them to Town Lake Animal Shelter where they were nursed back to health and sent to live in foster homes until they were old enough to survive shelter life. Our neighbors, who have been fostering litters of puppies for a few months now, took home 4 and immediately started socializing them. They brought the puppies out every day to run around in the front yard and play with the kids on the street. One of those kids was Fuzz, and of course she fell in love with HAL (formerly known as Oreo, but Fuzz just finished watching 2001 and really liked HAL the “Heuristically programmed Algorithmic” computer and decided to name it was a good name for a dog). In the back of our minds, we thought it might be nice to take in a puppy; but Lizzie was an issue. She’s top dog around here, and picky about who she’ll associate with. She’ll play with older, bigger dogs, but generally does not like puppies jumping in her face. So HAL sneaks up on her from behind. He’s a quick learner and while he’s cautious of Lizzie, he’s made a hobby out of trying to be her friend. And Lizzie’s starting to like him. She’s still a little bossy, but she shares her toys and doesn’t attack him at meal times. They’re both pretty into food and love lying around the kitchen…. HAL is not house broken yet and my goal every day is to tire him out so he’ll nap and I can get some work done. When he’s up and about, we all have to keep an eye on him. We’re not sure what breed he is, but if you have any ideas let me know! He’s definitely part Australian Shepherd and has kind of a half tail. The vet said he might be part Sheltie because he has a super soft coat, but his back legs remind her of a terrier — maybe even a Jack Russell. I’m thinking about getting a dog DNA test but not sure whether those things are legit. OK, it’s been awhile since I checked in. I missed the Hal announcement! He’s so cute! I give you a lot of credit — I’ve wanted a second dog for ages but the hubbie says no way. I love HAL so much now that we have him! He is really happy here with my parents and Lizzie. HAL thanks you for all the comments! Oh my…HIGH cute quotient! 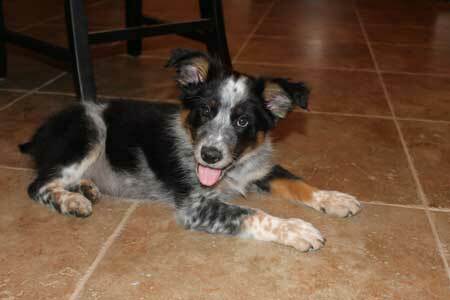 Before I read the part about him being part Aussie, I was going to post and say definitely part Australian Shepherd! I wouldn’t call him a tri though…he has too much merle in him IMHO..not that it really matters! I wondered about some terrier as well but more as I thought his coat looked like it might be a bit harsh but you say it is soft…not that a terrier can’t have a soft coat! My first dog of my own was a very hairy mutt that I would have LOVED to have known WHAT was in him….best guesses were definitely some Beardie (Bearded Collie) and clearly some terrier of some kind as well. He tested on sheep very well…at the ripe old age of 13! Thought he had died and gone to heaven when in the pen with them! I so loved that boy who I had found abandoned in the inner harbor in downtown Baltimore when he was about 5 months old (vet’s guess at age). He led me down so many paths…including becoming obsessed with competing in dog agility (maybe Fuzz would like to train HAL? VBG! )..and became my introduction to my breed of choice…beardies (now have two of them:-). ENJOY! Puppies are such great little sponges for learning! HAL is adorable – I look forward to seeing plenty more of him. Awww, so Lizzie is a big sister now! Hal is so cute. Your description of Lizzie sounds so much like our Maddie. Our Maddie is also top dog around here. Tyson has now given Missy a little bit of a “new youth”. 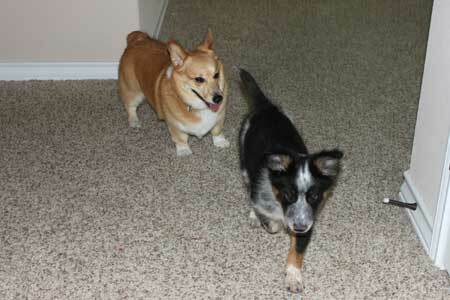 Instead of lying around bored all day as she used to do, she now romps around with Tyson and is much more energetic! Here’s a link to an NPR story about doggie DNA tests. I think the tests are more for the entertainment value than actually finding out for sure. My friends did it and were going to do a party with a ‘guess what kind of dog’ theme to it. In any case, HAL is a cutie which in the end is all that counts! Enjoy! And good luck with the potty training! Sooo cute. 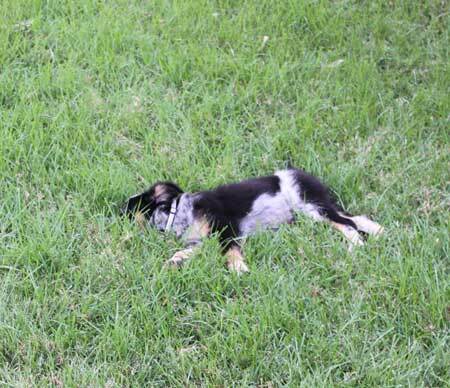 I would guess Hal has a bit of Border Collie as well as Aussie Shepard and possibly Sheltie….all very smart dogs. In any case, he looks like he has lots of herding dog DNA and will need lots of exercise and possible a “job” to keep him occupied. It might be fun to see if he would be interested in agility work. Your daughter might really get into training him. Hal has adorable facial expressions! He’s lucky to have found such a loving forever home. He looks like a perfect little kitchen helper. And the fact that he’s a mysterious mix adds to his charm. 😉 It’s like trying to figure out what ingredients go into a tasty recipe – the fun is in the guessing. Congrats! What a total cutie. Read you every day but never commented. You’re going to have blast with him, once you get through the house training, etc. Bless you for taking in a rescue. He is adorable, what a face! Rescue dogs make the best pets! 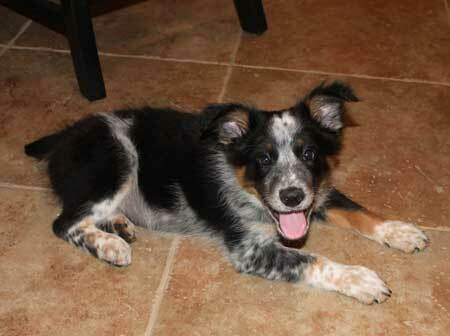 He is definitely a herding type, maybe blue heeler or cattle dog? They have those speckled markings. Congrats! Oh my word! Hal is just the most adorable! We recently (December) got an Austrailan Shepherd puppy – our first. His name is Blue and although he is sooo cute and can be so sweet, he is an EXTREME handful. I know what you mean about having to constantly watch them. I’m telling ya, if I don’t hear him for a couple of minutes, then I’m searching for him because I’m certain he is up to no good. He has chewed up so many nice shoes, blanket, toys…the list goes on. I love him though and I know that puppies chew and potty wherever they want! Does Hal have those herding instincts? Love his little tail. I can’t wait to see more photos of him. You are sure going to have your hands full with 2 dogs!! He’s adorable! And HAL is a great name. Adorable puppy-Hal won the lottery! It shouldn’t, but it still does surprise me how cruel people can be. Congratulations on your new addition! 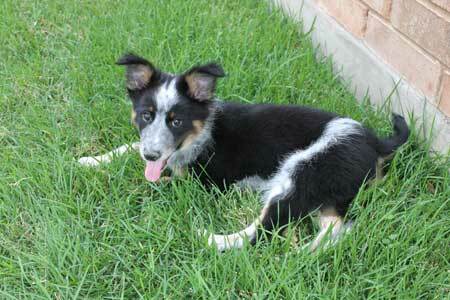 He is beautiful, reminds me a little bit of my brother’s border collie. So cute!! What a great story to share. 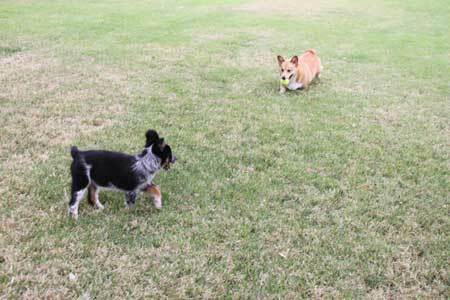 Two herding dogs in the family=off-the-charts canine IQ! And how nifty that your daughter named him HAL after 2001! Very cute :). As soon as I read HAL I was really hoping it was a 2001 reference (what else could it have been?) but would have never expected your daughter to be the one to choose it :). Bravo to her for watching it :). Welcome to the CM family!! Anna, glad you are back in the saddle (so to speak;-))!!! Always wonderful to adopt a pet in need. Congratulations on the new addition to your family! Hal is a cutie for sure. Aw, sweet! Before you even said so, I could tell Hal was an Aussie, since our Chip is, too. But yeah, I have no idea about what else he might be since Chip is pure bred. They are called Black Tri Aussies (since there is white, black and brown). Hal is shorter haired than Chip, so he’s definitely got something else in him, too. 😉 Ah, the potty training. Yep, when we’re not sure if Chip will go or not, still, we put him in his crate for a while to get things done. And we have two hallways blocked off so he can only go in a certain part of the house (the living room kitchen, where I’m almost always at). Welcome, Hal. Awwww! I love puppies so much!! He’s adorable! I’ve wondered about those dog DNA tests too, but on the up side our old vet who was very much on the up and up had a sign for that test in her office so maybe it’s legit? I don’t know enough about dogs to venture a guess at his background. Awww. I am always such a sucker for a puppy. I love their oversized paws. So cute. My dog’s the same way; in my imaginary world I like to think about getting a second dog, but he’s definitely top dog as well and I don’t know how he’d take to this. Whatever Hal is, he is a cutie! We recently got a rescue dog too (a mix of boxer, lab and maybe 16 other breeds) and she’s a handful but definitely worth it. Enjoy! What an absolute cutie-pie! Kudos for giving this puppy a loving home! I’m sure he’ll be well worth it! I can see why Fuzz fell for HAL. Such a cute puppy. Based on his paws, he doesn’t look like he’ll grow into a huge dog.